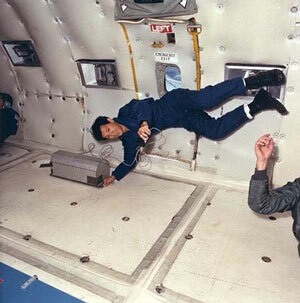 "Amodal Suspension" opened at 19:00 Japanese time (10:00 GMT) on November 1st, 2003 with messages sent by astronauts Pedro Duque (Spain) and Mamoru Mohri (Japan). A symposium on the project took place on the 2nd of November at 18:30, featuring philosopher and author Brian Massumi, Cultural Studies theorist Yoshitaka Mori, project curators Yukiko Shikata and Kazunao Abe and artist Rafael Lozano-Hemmer. To show appreciation for the YCAM staff and the people of Yamaguchi, Lozano-Hemmer invited everybody at the YCAM park for Mexican beer and hot Chai. This event took place on the 3rd of November at 18:30. On November 9th at 14:00, local researcher Shimgo Hirano spoke about fireflies. On November 15th at 19:00, Akira Suzuki, Professor of Kobe Design University, presented Soft Shelter: electronic networks in the city and hand-drawn maps. On November 22nd at 19:00, Dr. Jun Tanaka, Professor at the University of Tokyo, presented On the history of light in the city. Atronaut Mamoru Mohri suspended in space. His opening message was: "The earth is a dream which shines in vivid blue through a pitch-black universe." The opening message for the project from Astronaut Pedro Duque at the International Space Station was: "Astronautas - Mirad la nueva Aurora Iaponesis"